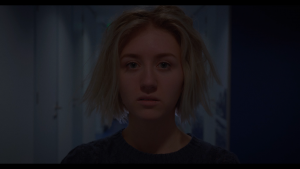 LOCKLINEA short sci-fi/thriller on the disastrous consequences of social media addiction. It's like a sickness... Spreading through the entire country. There are reports incoming of random people attacking each other. They're becoming like zombies. Actual zombies. An empty battery can cause injury. Disconnected internet can lead to people dying. This needs to be stopped, before it's too late. Step into a random train and take a look around you. I can already predict what you’ll be seeing: two rows of people, with their bags put on the seats next to them, looking at the devices in their hands. Not surprising, of course, since train rides are often long and boring. People stare at their phones and don’t pay attention to the fellow travellers around them. However, it becomes problematic when people are out for a drink with friends or family, and all they do is stare at their phones. It becomes even more problematic when your child doesn’t know how to amuse itself anymore without digital distraction. It seems as if the smartphone has become integral to our modern lives and we cannot be separated from it. Why do people do it? Why do people rather engage into their (social) apps, rather than engage in interesting conversations, the outside world… or even a book? Is real life that confronting? I, Kilian, often observe this behaviour with myself as well. And I see it as a dangerous phenomenon. It’s only since recently that the negative effects of this social media/smartphone addiction have been researched. Using social media & receiving likes stimulates our brain’s production of the dopamine: a similar effect can be measured when drinking alcohol or taking drugs. You probably recognize the sense of panic when you can’t find your phone… Of course, the factual effect of receiving a ‘like’ on Facebook cannot be compared to the consumption of cocaine. However, because of the constant flow of dopamine we need from our smartphones in order satisfy ourselves, and feel uneasy when we don’t receive it, we need to take this addiction seriously. Not only can the overuse of social media lead to social anxiety or depression, it also influences our day-to-day choices and behaviour. Our daily social media routine results in that we are constantly measured, tapped and influenced by data-collecting organisations. It influences our buying behaviour, self-image, social and moral values, and even our political viewpoints. Your constant exposure to social media does not only affect yourself, your personal environment and family and friends, but it even takes control of what you do and what you think. We are more exposed to different opinions, but we listen less. We can instantly obtain information, but we learn less. You say we are more ‘connected’? I’d say, less! 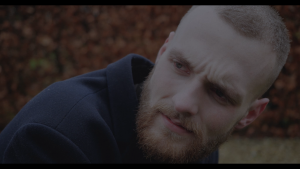 An idea that originally arose during a mountain walk in Scotland got developed into a script for a short-film of 7-10 minutes telling the story of Jim and his sister Anna in the form of a sci-fi/thriller. Together with local and international talent living in the Northern part of The Netherlands, the goal is to make a successful first move in the international film industry. The aim is to finalize the film before halfway January 2019. When successfully produced, the film has the purpose to compete in (amongst others) the Noorderkroon competition of the Noordelijk Film Festival 2019, as well as the Go Short Film Festival Nijmegen and the Brussels Short Film Festival. This film needs to be made in order to make people realize the consequences of their smartphone/social media addiction. I hope to stir up a discussion and awareness on our own unhealthy digital behaviour. However, making a film costs money. Even though the hours I and the crew will put into the film are unpaid, the other costs are unfortunately not covered yet. Your donation will help ensure that the set, equipment, travel and food costs are covered. However, it will also enable the film to compete in national and international short-film festivals! Your help is needed to spread the message and make people around you aware of the consequences of their digital addiction. Of course, several perks are offered in exchange for your support. Let’s make this short film a success together and make a donation! In case of overfunding, the remaining finances will be invested in the next project of Clanstate Pictures (on the topic of freedom of speech!). You are ensured your contribution will find the purpose it is intended for. Over the last few years Kilian has actively engaged in societal/political issues and initiated several A/V projects as student at NHL Stenden University, HSB Bremen and visits to Japan. Being a graduating student, he decided that it was time to put his ideas into action and founded his film company Clanstate Pictures. Connection Down is his project debating the long-term effects and dangers of the overuse of social media. Five years ago, he already tried to warn his environment on the dangers of social media in the form of an article published on NLHub. The social media trend, however, has continued, and steadily gotten a stronger grip on people’s lives. 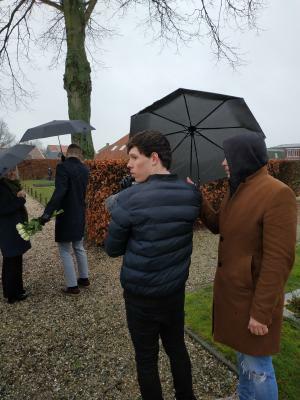 Together with local and international talent in the area of the Northern part of The Netherlands, he attempts to realize this short-film project. Visit Kilian's Instagram @VanHarckema and the website of Clanstate Pictures! Succes met de film! Leuk om mensen uit Nederland te zien die hier ook bewust mee bezig zijn. Ik zag je op de humane tech community. Mooi initiatief. That's an amazing project! I love supporting your ideas!! zet 'm op Kilian. Maak ons trots! Update: De film is af! Zo goed als, tenminste. Afgelopen 5 weken zijn we hard aan de slag geweest met de productie van de film, dus nu is het hoog tijd voor een update! Nadat we 3 januari een auditieronde hebben gedaan, hebben we de getalenteerde Renée Wiersma uit Bolsward en Stan Tjassing uit Groningen uitgenodigd om de hoofdrollen te vertolken. 12 en 13 januari zijn we met zijn allen op pad gegaan om de film op te nemen. Om 8 uur 's ochtends stonden we, enigszins gespannen, klaar om naar de eerste locatie te vetrekken in Warns. In Sondel werden we vervolgens verwelkomd door Marcus Noordmans, die zijn mooie huis beschikbaar stelde voor de eerste paar scènes. De draaidagen verliepen vlot. Dankzij een strakke planning en een uitermate goede inzet van de crew hebben we de twee dagen volledig volgedraaid. Uiteraard ging het niet allemaal even gemakkelijk. En regende het af en toe ook nog eens flink. Maar we hebben het gered. 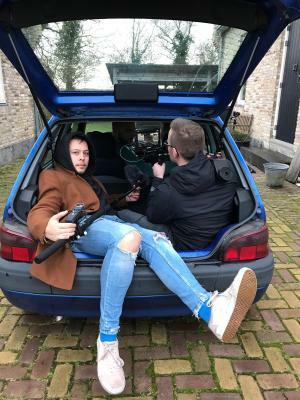 En ook met Lars, Dylan en Steven, in en om Wietse zijn auto, is het allemaal goed gegaan. 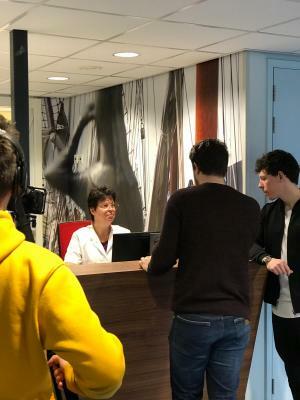 Daarnaast mochten we Rommy Walinga verwelkomen voor de rol als doktersassistente, en ook zij bleek uitermate geschikt. Erik Beyrens heeft ons ook nog geholpen met een korte voice-over! En toen te montage... Uiteraard, zoals altijd, een knap lastig werkje. Maar uiteraard is geen enkele film Bas te ingewikkeld! Dus voor nu: een geslaagde film! Klaar om opgestuurd te worden naar (korte) filmfestivals. Over de hele wereld, uiteraard, zodat de boodschap in elke uithoek gehoord zal worden. Daarom is de film ook vertaald in 8 verschillende talen! Met dank aan vele internationale vrienden en kennissen. Updates zullen volgen over de progressie en de participatie in film festivals. Daarnaast zullen vanaf nu de rewards langzaam jullie kant op komen, en volgt binnenkort de datum voor de première! Voor nu wil ik iedereen alvast bedanken voor de geweldige samenwerking en inzet. Update: The film is done! As good as, at least. 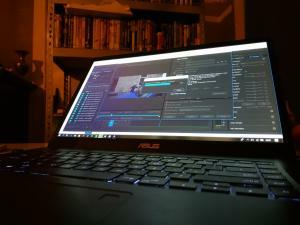 In the past 5 weeks we've been working hard on the production of the film, and now it's about time for an update! After we've held an audition round on the 3rd of January, we invited the talented Renée Wiersma from Bolsward and Stan Tjassing from Groningen to take on the roles of the main characters in the film. On 12 and 13 January we've all hit the road to record the film. At 8 o'clock we were ready (and of course kind of nervous) to leave for the first location in Warns. 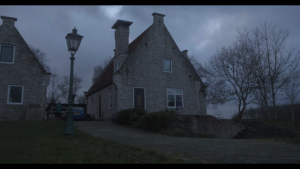 Following, we were welcomed in Sondel by Marcus Noormans, who made available his beautiful house for the first few scenes in the film. The shooting days were going smoothly. Thanks to a strict planning and excellent effort put in by the crew we've completely filled the two days. But of course, not completely effortless. And sometimes it was truly raining cats and dogs. Next to that, we were able to welcome Rommy Walinga for the role of doctor's assistant, and she also proved to be very suitable for the rol. Erik Beyrens also made a contribution with a short voice-over! And then... editing. Of course, like always, a pretty hard job. But of course, there's no film too complicated for Bas! So for now: a succesful film! Ready to be sent to (short) film festivals. Around the whole world, so the message will be heard in every corner of the planet. That's why the film was also translated into 8 different languages! Thanks to many international friends and acquaintances. Updates will follow on progress and participation in festivals. Next to that, the rewards will slowly come your way, and soon the date will be published for the official première! For now, I'd like to thank everyone for their wonderful cooperation and effort. Ja!! Gehaald. En nu aan de slag! Vandaag om 12:00 was de deadline voor de crowdfunding campagne van Connection Down – en we hebben het gehaald! Dit is natuurlijk een mooie mijlpaal en daarom wil ik jullie allemaal van harte bedanken! Je ontvang updates (zoals je die afgelopen weken via mail hebt ontvangen) met nieuwtjes, de voortgang van het project en ook artikelen, video’s en onderzoeken over het onderwerp dat we met deze film aan de kaak willen stellen. Een mooie mijlpaal, dat zeker, maar nu is het tijd jullie vertrouwen en steun terug te betalen en er een mooie film van te maken! The deadline of the crowdfunding campaign of Connection Down was today at 12PM – and we made it! This is of course a milestone to celebrate and therefore I’d like to sincerely thank you all for the support. You will receive updates (as you received them via email during the last weeks) with news, progress on the project, and also articles, videos and researches on the topic that we’d like to address with this film. A milestone to celebrate, of course, but now it’s time to pay back your trust and support and produce a wonderful film! 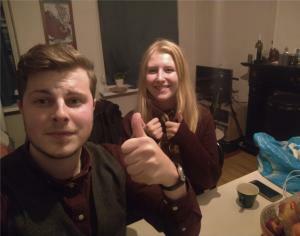 Thumbs up from me and the teaser actress, my sister! Eternal gratefulness, and of course, updates on the project. You will receive a link to watch the film after it is finished! I will send you an official Clanstate Pictures sticker if you leave your address, wherever in the world! You get an invitation to the exclusive premiere of the film. And of course, you receive updates and the link of the film. Your name appears on the credit roll! You will also receive a sticker, invitation to the premiere, and of course updates + link on the film. Anyone with the ambition and willingness to improve their camera skills deserves to receive the knowledge required. Therefore, you will be offered a digital photography or videography workshop (beginner level) given by Kilian, in Leeuwarden. Of course, your name will also appear in the credits, you receive an invitation to the premiere, a sticker, and of course updates + link of the film. Your seat will be on the first row during the premiere! You will also receive the workshop, appearance in the credits, an invitation to the premiere, a sticker, and of course updates + link of the film. Being such a generous contributor, you will receive a special thanks during the premiere. Of course, you will also receive first row places, the workshop, get your name mentioned on the credits, receive a sticker, and get updates + the link of the film.